Manufacturing Barcode solution exclusively for Sage 300 ERP. 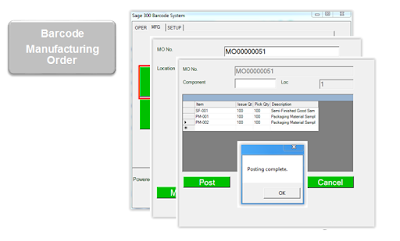 The new Barcode modules will cover Sage 300 Manufacturing transactions as well as standard Sage operational modules (e.g. O/E, P/O, I/C). For manufacturing companies, inventory transactions affect purchasing, sales and manufacturing orders on the production floor. Managing the movement of inventory efficiently between these various stages can reduce production cycle times, direct and overhead costs as well as customer delivery/order shipment times. The new Barcode solution is a simple way to add bar coding to your production process in Sage 300 Manufacturing Orders and Shop Floor Control as well as the Operations Suite of Sage 300 ERP including Inventory Control, Order Entry and Purchase Orders. Easy to deploy and use, the new Barcode module will ensure real-time posting of transaction and higher data accuracy. Inventory is the life blood of wholesale distributors and manufacturing companies. Being able to pinpoint the exact location of inventory in a warehouse reduces shipping errors and handling costs. Managing returns effectively reduces costs and improves customer service; utilizing bar code scanners increases throughput for receipts, shipments and inventory transfers as well as physical counts. If you have to manage inventory, we can help you be more efficient and effective. 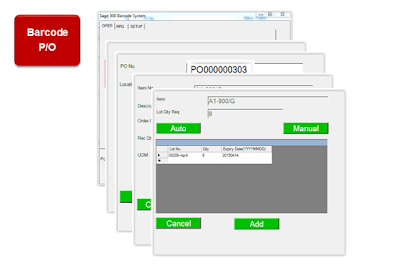 The new Barcode solution is designed to be a simple plug-in product to Sage 300 ERP. Easy to deploy and use, the new Barcode module will ensure real-time posting of transaction and higher data accuracy.